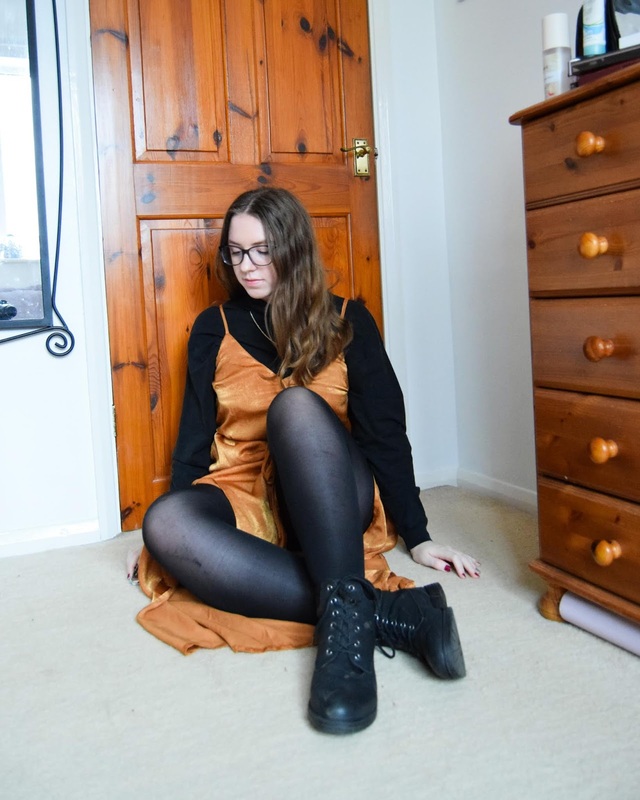 This is the dress that featured in a blog post back in the summer, that you can totally check out here if you want to, shameless self-promo right there, which I received from BooHoo. And since then it hasn't really left my wardrobe. But it finally got to see the light of day again for this photoshoot. Since the dress is already in a neutral tone I kept that theme running through with the black long sleeve turtle neck. I love the layering look with turtle/high necks and short sleeves anything over the top. I really don't wear it that much since my tops just don't match up so this was my first proper chance at putting this trend into action. To make it more suitable for winter I added the black tights and the black flat boots. Not only for warmth but also I'm not really sure I'm up for wearing heels when there are possibilities of frost and ice, I'm already clumsy without wearing heels, so it's definitely safer for me to wear anything flat. To be honest, it would have made more sense if I added a jacket to this outfit, but I had left most of them at uni over the break so didn't really have any that matched the outfit at home. What sort of jacket or coat do you think would work best for this. I'm going to keep this post short and leave it here with the photos doing most of the talking. Do you wear many dresses in the winter or do you stick to keeping covered up more?